Looking for comfort food? Here are five Oakland picks for warming winter soups. Kuy teav Phnom Penh is the dish that put Nyum Bai on the map. It seems like ever since December hit, I’ve been craving soup a lot more often. When you want to tuck into a bowl of steaming soup, here are a few suggestions to help you stay warm in Oakland. Kuy teav Phnom Penh is the dish that put Nyum Bai on the map back in its days as a pop-up, and for good reason. The rich pork broth is simmered for seven hours, resulting in a broth that’s sweet, salty, garlicky, and a little funky. 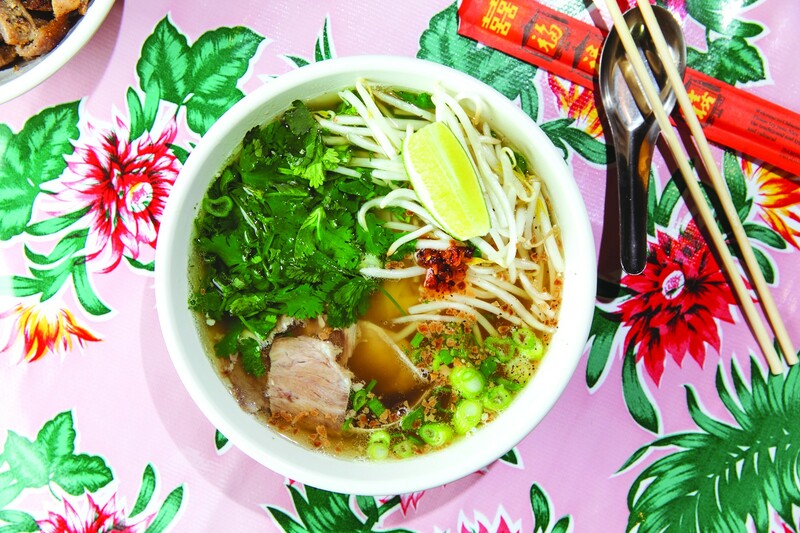 The soup is chockfull of rice noodles, pork, and shrimp, topped with bean sprouts, cilantro, and a wedge of lime. Pro tip: I usually order mine with extra noodles, and I like to add a little smoky chili sauce. And if you’re visiting with vegan or vegetarian friends, I’m also a huge fan of the vegan machoo manor soup, a sweet and sour broth filled with fried tofu, pineapple, tomatoes, and mushrooms. Just across the plaza from Nyum Bai in Fruitvale Village is Obelisco, a place I’ve been visiting for years for its pozole, ever since it was known as Taco Grill. The pozole here comes with a red, green, or clear broth — one for each of the colors in the Mexican flag. I’ve tried them all, and in my opinion, the green one with pork is the best. The spicy green chile broth is sure to warm you up, and the squeeze of lime on the side adds an enjoyable hint of acidity. Whether you call it jook, congee, or porridge (as it’s listed on the menu here), it’s basically liquid comfort in a bowl. If you can’t get it homemade, Gum Kuo is the next best option, and there are enough varieties of jook here to make your head spin. My favorites are the salted pork and preserved egg porridge, the abalone and chicken porridge, and the sliced fish and pork ball porridge. Pyeongchang Tofu House is known, of course, for its excellent soft tofu stew. But I’ve also been a longtime fan of its short rib stew, which is listed toward the end of the menu. The clear bone broth is so rich that it almost tastes like it’s made with butter. The short rib meat is tender enough to cut with a spoon, and the cabbage adds hearty crunch. Plus, you get a complimentary extra “soup” — ask your server to pour hot tea into the crisp rice that’s left in the stone bowl at the end of your meal. Just a few weeks ago, I went to Tortas Ahogadas Mi Barrio to try their namesake tortas ahogadas — but I was pleasantly surprised to find carne en su jugo on the menu. It’s a soup popular in Guadalajara that’s typically made by simmering tomatillos and beef in bacon fat. Pinto beans and chunks of bacon are then added to the soup, which is served with tortillas on the side. Beware, the carne en su jugo is only available on Saturdays and Sundays, and it tends to sell out.